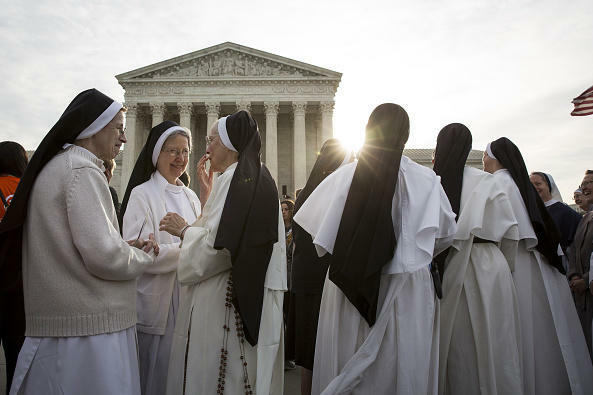 Nuns opposed to the Affordable Care Act's contraceptive mandate rally outside the Supreme Court on March 23 prior to oral arguments in Zubik v. Burwell. The Supreme Court sent the case back to a lower court on Monday. As we reported when the case was argued, the Affordable Care Act does not require religiously affiliated employers to provide contraceptives to their employees. It does, however, require them to write a letter notifying the government that they object to the coverage and who their insurance provider is. That provider would then offer contraceptive coverage to the employees. The organizations suing the government argued that writing the letter made them "complicit in sin." After the case was argued before the Supreme Court, the justices asked the government if "contraceptive coverage could be provided to petitioners' employees, through petitioners' insurance companies, without any such notice from petitioners." According to the court opinion out Monday, the government said it was a feasible option, and the religious organizations suing said they could live with a solution where they "need to do nothing more than contract for a plan that does not include coverage for some or all forms of contraception." NPR's Nina Totenberg tells our Newscast unit that it's likely to be a tough negotiation that will be hashed out in lower courts once again. The Supreme Court was considering the fate of four different decisions from the U.S. Courts of Appeals for the Third, Fifth, 10th and D.C. Circuits. The court vacated all those judgments and sent each respective case back to the lower court. If there is still disagreement between the parties, one or more of those cases could end up before the Supreme Court yet again. "The devil is in the details," Nina said. "How can religious organizations not have to notify the government themselves or the insurance company themselves that they are not providing contraceptive coverage? Is there a way to keep their hands off it so that the government knows who should be provided that coverage independently by working with the insurer without any input from the religious employer."